Summer is almost here and that means dressing for warm weather and putting together outfits for every occasion, like going to the beach, exploring a new city or going to dinner with friends. Incorporating a silk scarf to your outfit will add a fun and chic flare. Silk scarves have recently been seen as an accessory for your hair, but there are so many other ways to style them in your outfits. The silk scarf look is reminiscent of Jackie O. and Marilyn Monroe, and this classic style is finally making a comeback. Adding a silk scarf has the ability to boost any simple outfit or add a vibrant pop of color when needed. When it comes to adding a silk scarf to your outfit, there are so many different options. You can wear them as a belt or even style them as an accessory on your bags. Here are four easy ways to style this versatile piece and step up your summer outfit game. A fun and unexpected way to style a silk scarf is as a belt. Simply pull the scarf through the belt loops on your jeans, or even around your waist to belt a loose dress. This look will instantly take a sundress or your favorite pair of denim to the next level and even add some color depending on the scarf you choose. This look is a subtle way to add some flare to your outfit. Accessorizing your bag with a silk scarf is an easy way to step up your outfit without doing too much. Loop the silk scarf around the strap of your chosen bag and tie it in a knot. Instead of a bracelet, opt for a silk scarf to create a softer, girly vibe. Again, this is an easy way to add some color or a pattern to your outfit. Tie the silk scarf in a bow or knot around your wrist. If you’re going for a clean, classic look, wearing a silk scarf around your neck is a great option. There are so many different ways to style the scarf this way. For events like music festivals you could go with a bandana style. For other summer occasions, try tying it in a knot off to the side for a Parisian, French-girl look. Tag us on Instagram, @VALLEYmag, with pics of your favorite ways to style a silk scarf this summer. 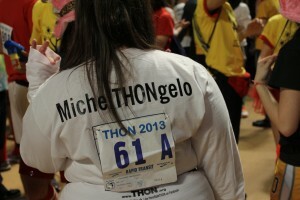 The overall committee might be the presidents of THON, but dancers are godly. They also get to choose awesomely hilarious names to represent themselves with all weekend. Below, find our fave silly nicknames.